Pizza and beer just go together. It’s a universal truth. At OTTO, we are always looking for ways to work with our local breweries: tap takeovers, limited edition collaborations, even using craft beer as an ingredient. Lately we’ve been working with breweries in a new way. We’re excited to announce that we now offer pizza delivery to select breweries in both Maine and Massachusetts! 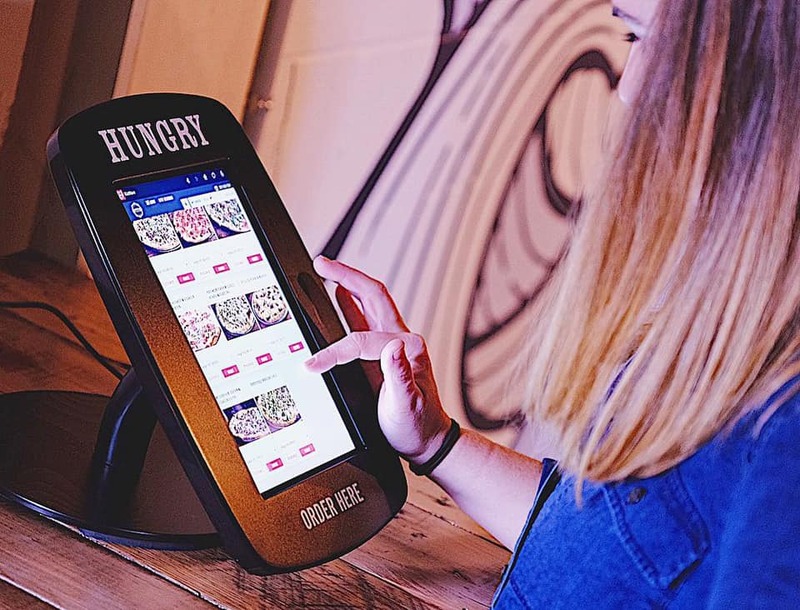 If you’re a regular on the tasting room circuit, you may have seen one of our ordering tablets already. They’re simple to use and just like ordering online. After approaching the OTTO ordering kiosk, enter the delivery address that’s conveniently listed on the bottom of the tablet. 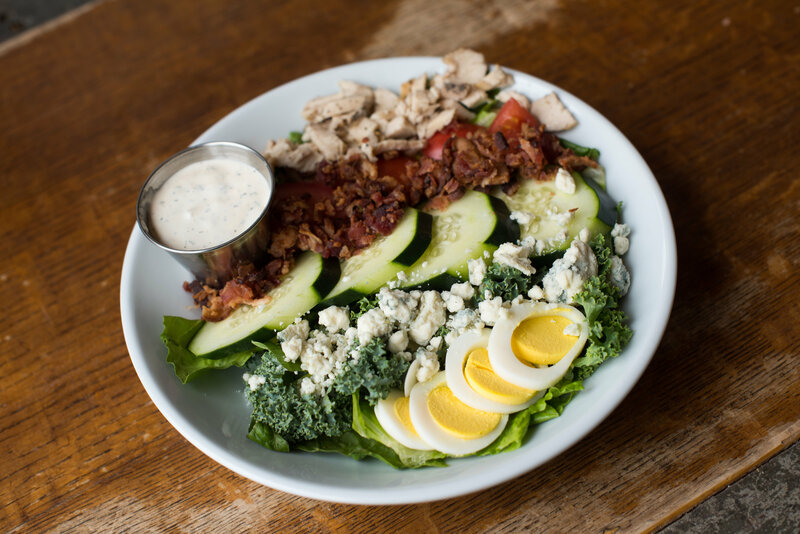 Once the address is entered, click “order” and select “ASAP” to get your order started. 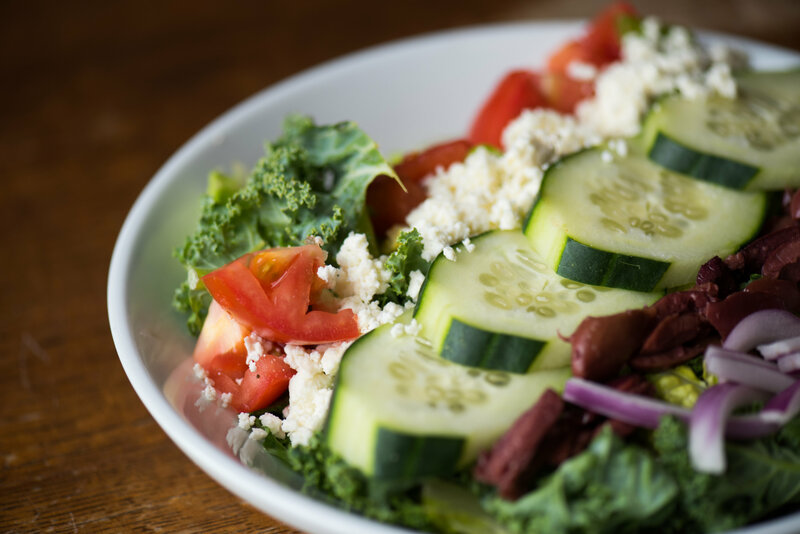 Place your order as you normally would by selecting your favorite pizzas, salads and apps. All you’ll need to complete your order is your name, phone number and payment information. You can also enter your OTTO Rewards information to earn points on your delivery. Delivery typically takes 35-45 minutes. 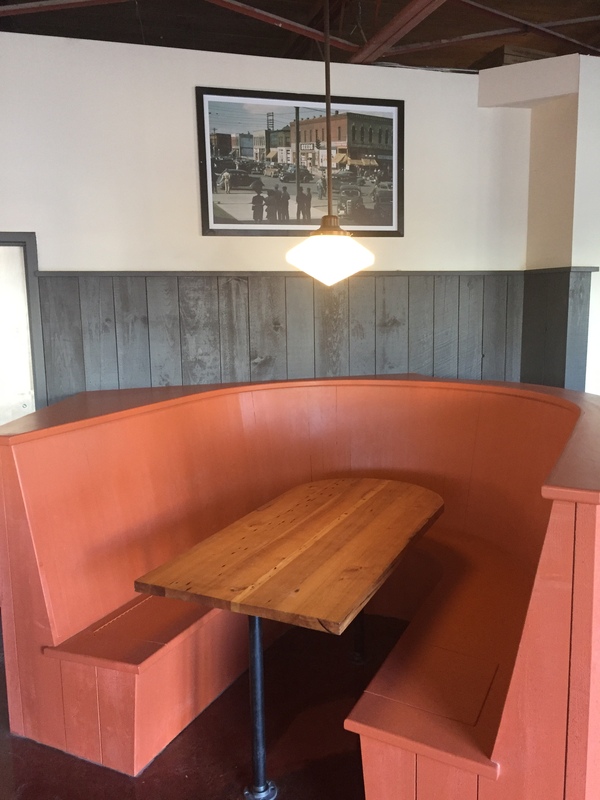 This leaves you a little time to enjoy some beverages while you wait for your order. If you have any questions or need to make any changes to your order, simply call the number listed at the bottom of the kiosk to reach the OTTO team handling your order. 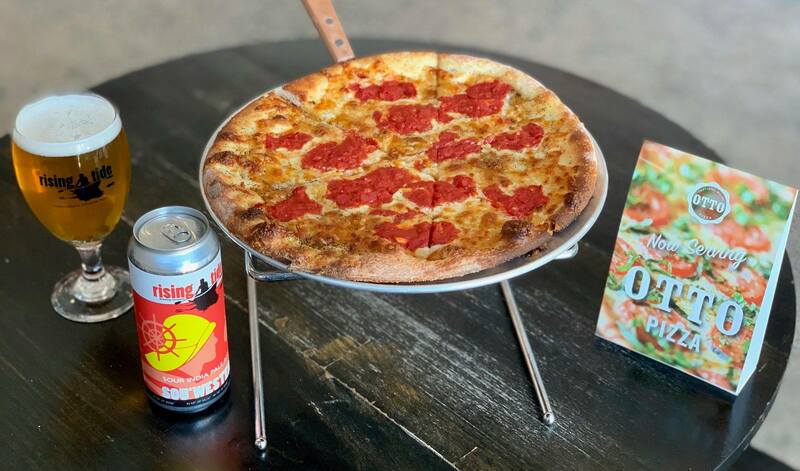 OTTO Pizza is also available at the Rising Tide tasting room in Portland (103 Fox Street, Portland, ME) . 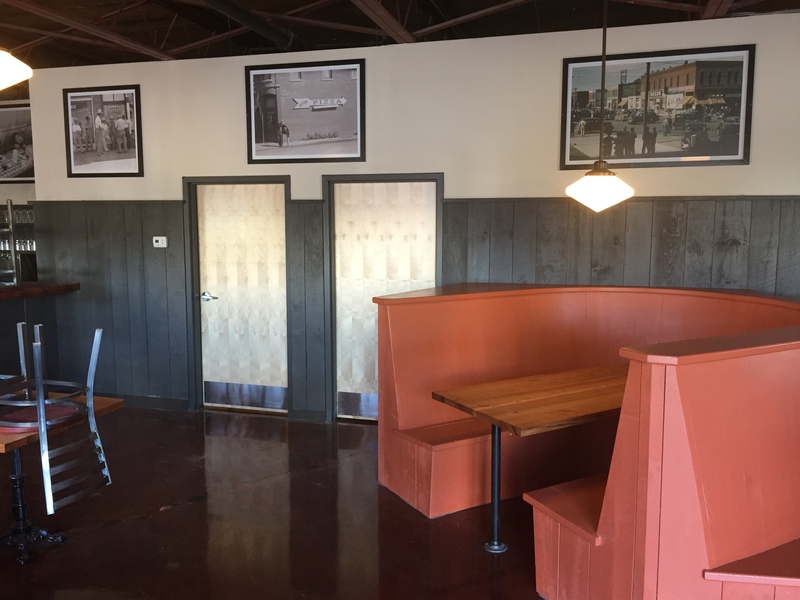 They offer slices, as well as small pies, right there at the tasting room. 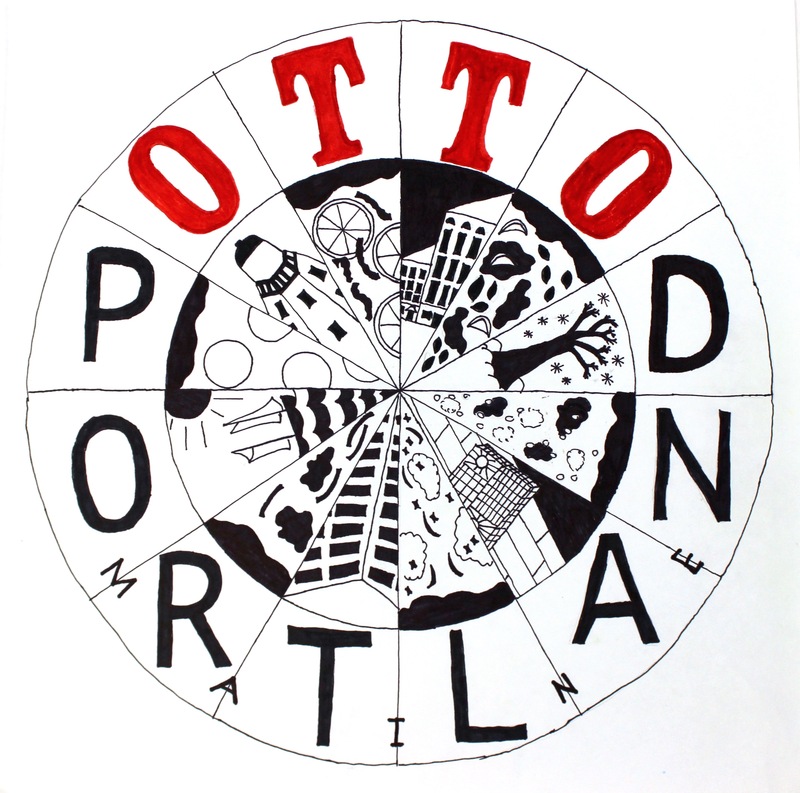 If you are a brewery or other business interested in offering OTTO pizza at your establishment, please contact us at catering@ottoportland.com for more details. 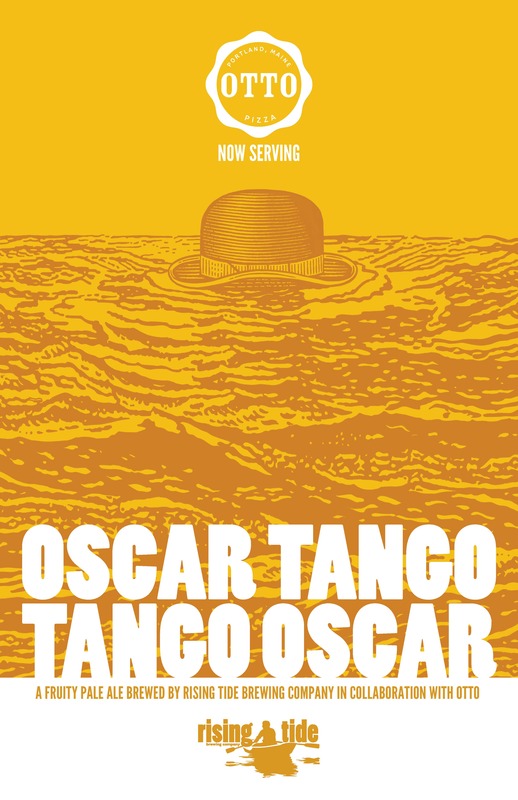 Our annual Spring collaboration with Portland’s Rising Tide Brewing Company, Oscar Tango Tango Oscar, is currently pouring in Maine, and will be rolling out over the coming days in Massachusetts. Oscar Tango Tango Oscar is brewed with 2-row, flaked rice, carapils and hopped with Amarillo, Mandarina, and Cascade hops. It is fermented with Rising Tide’s house American ale yeast. Oscar Tango Tango Oscar’s citrusy snap goes perfect with an OTTO signature pie on a warm summer day. Over the years, Oscar Tango has accumulated an overall 3.8 rating on Beer Advocate and a 3.63 rating on Untappd. The collaboration is only available at OTTO and at the Rising Tide tasting room. Get it while you can. Check in on Untappd and let us know what you think! A free slice with the purchase of a specially priced local craft beer? Yes, please. Starting TODAY, 3/1 we will be offering a Happy Hour ‘Beer of the Month’ at all of our Maine locations! This month, our featured beer is Austin Street Brewery Patina Pale! We are working closely with all of your favorite local breweries to feature some really great beers in the coming months, including limited and exclusive offerings. 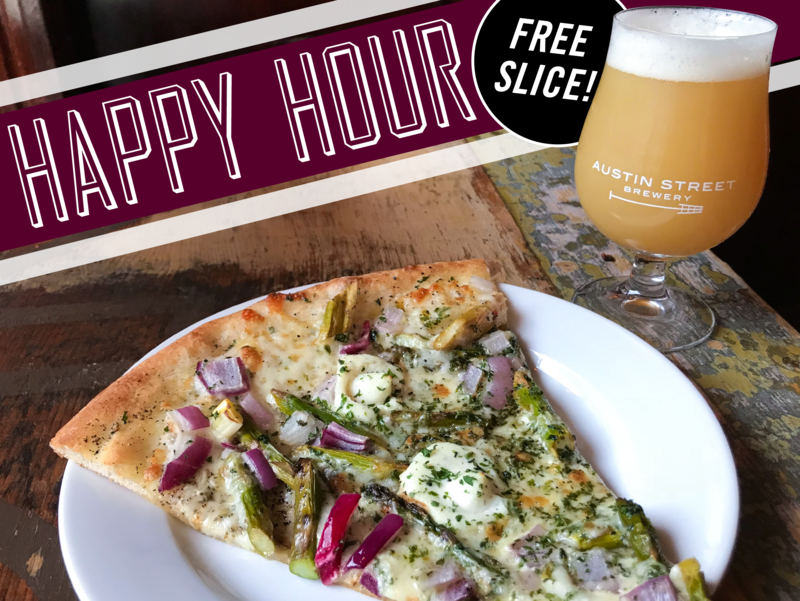 As always, wine is $5/glass and you can receive a FREE SLICE with a draft beer or wine purchase during Happy Hour – Monday-Thursday between 4-6 PM. 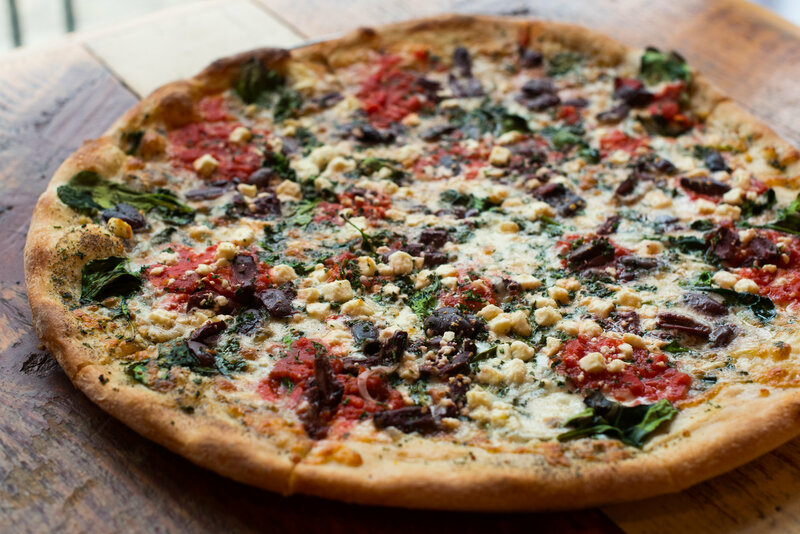 PLUS, our March special begins today – Lemon-Roasted Asparagus with Red Onion & Ricotta! 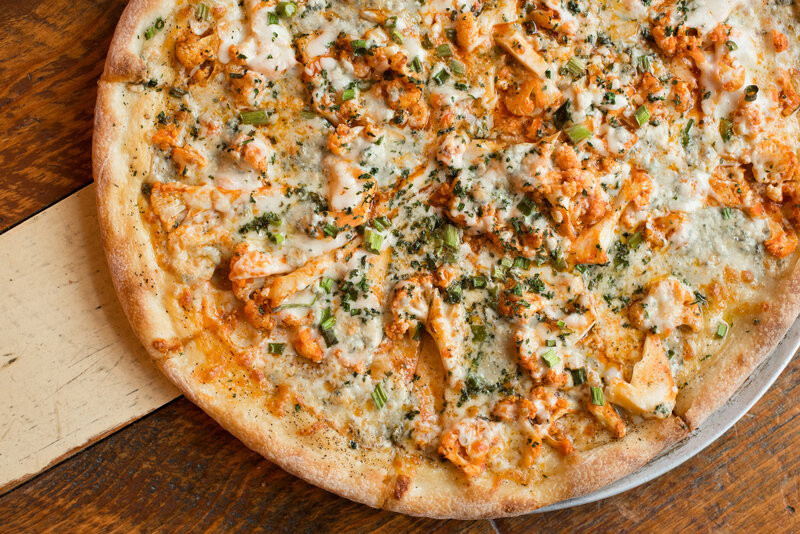 *limit 1 free slice per visit. Available at Maine OTTO locations only. 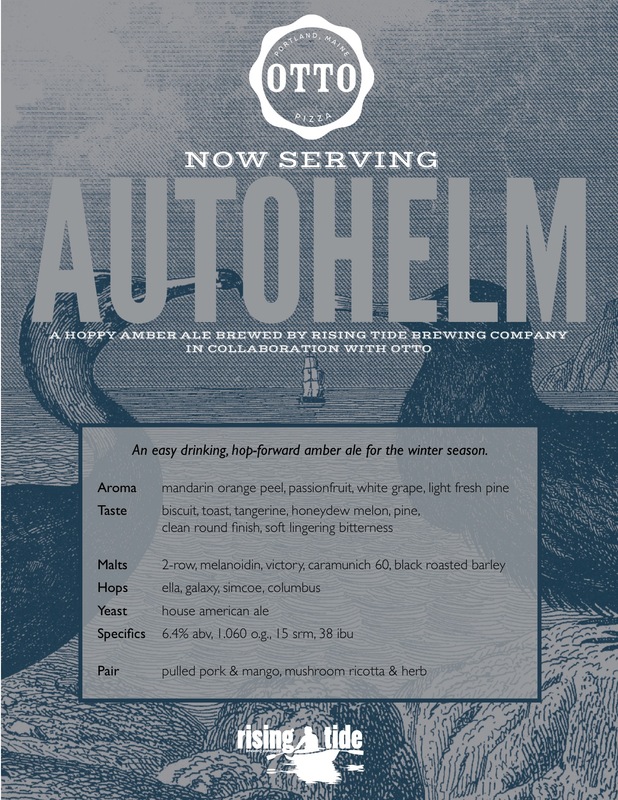 Autohelm: OTTO and Rising Tide’s collaboration brew is back for a limited time! We are pleased to announce the return of Autohelm, a deliciously hoppy amber ale brewed by Rising Tide Brewing Company in collaboration with OTTO. Diners at OTTO restaurants in Maine and Massachusetts will be able to pair their pie with this delightful winter brew, which made its debut last year. This limited special collaboration will be available exclusively at OTTO, as well as at the Rising Tide tasting room. 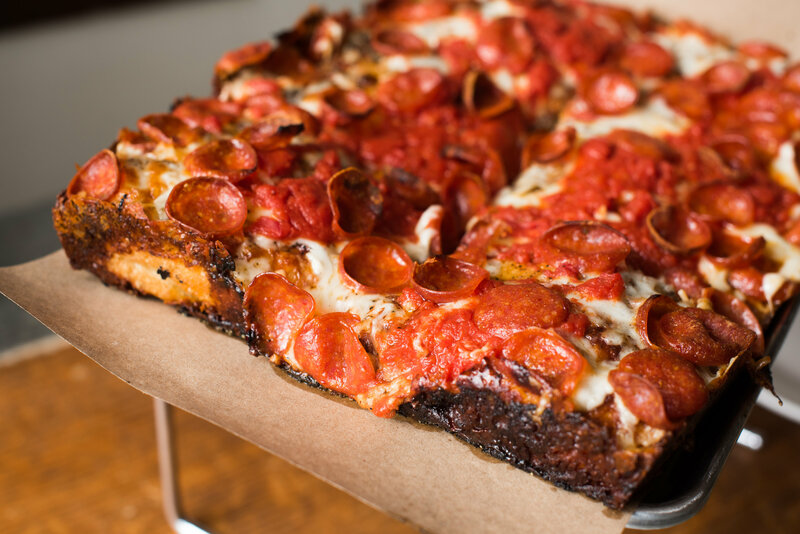 The beer is already available in Maine locations, with the Massachusetts launch party happening on Thursday, November 16 from 6-9pm, featuring OTTO’s Detroit-Style Pizza! If you haven’t had an opportunity to try Autohelm, you should get a piece of the action before it’s all gone. 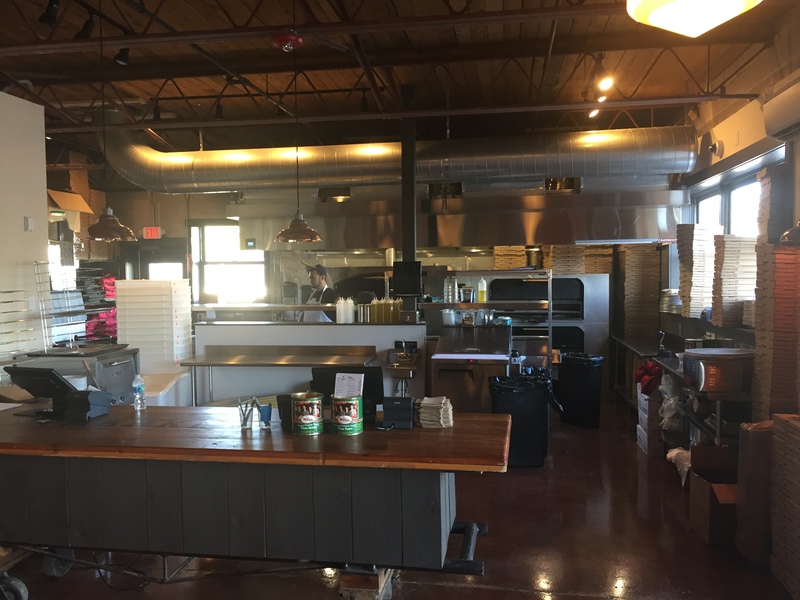 Come on down, grab a few pies, and a few glasses of Autohelm — and be sure to let us know what you think. 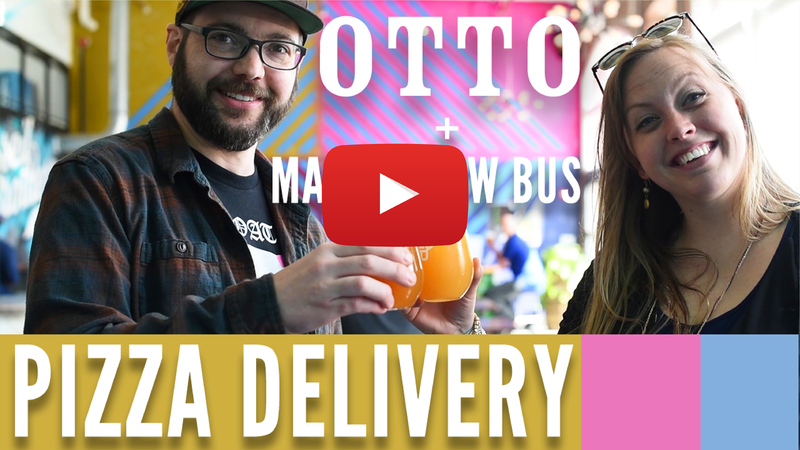 On one of the recent (and rare) blue-sky days this spring, we teamed up with The Maine Brew Bus to deliver pizza to the hard-working employees of seven local breweries and to educate our awesome employees on the Maine beer that we serve. We had a super fun day serving up some pizza love and getting our beer education on! Our first stop was in Freeport to check out Maine Beer Company before heading back south to Portland’s East End neighborhood to hit up Oxbow. 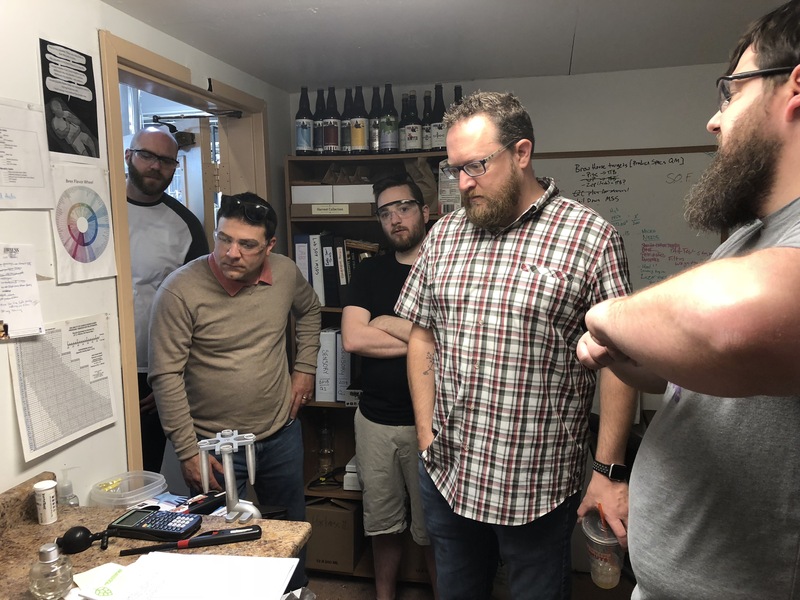 We hopped a quick ride on the bus down to East Bayside to partake in the beers of Rising Tide and Lone Pine, then finding our way over to Bissell Brothers at Thompson’s Point, before ending the day in Riverside at Allagash and Foundation. While our main gig at OTTO is crafting an array of delicious pizzas, we also like to celebrate the range of local craft beers we have on tap from breweries across New England. 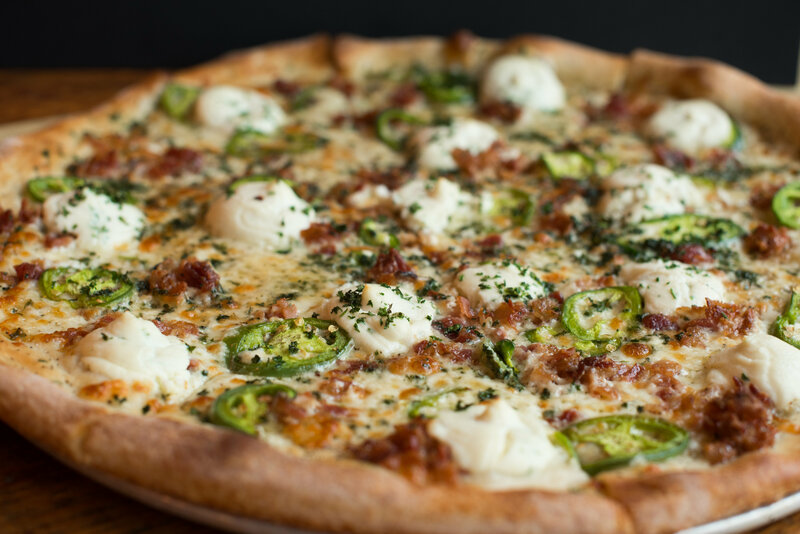 From an Austin Street Patina to a Lamplighter Lucid Nonsense, we’re always seeking out the best local beers to pair up with our pies and slices. Overwhelmingly we’re serving beers from breweries in the two states we call home – Maine and Massachusetts. Our New England offerings come from as far north as Atlantic Brewing in Bar Harbor and as far south as Stratford, CT, the home of Two Roads Brewing Company. Our Massachusetts beers come from as far west as Big Elm Brewing in the Berkshires to as far east as Cisco Brewers on Nantucket. 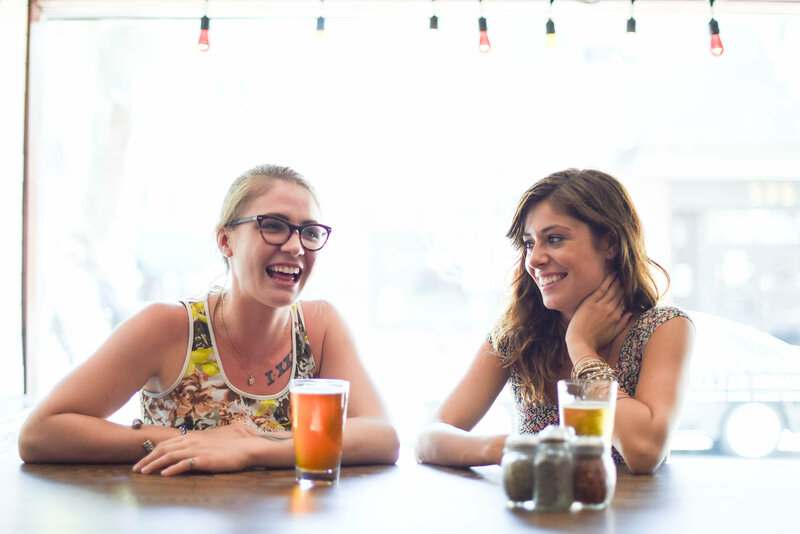 AND, just last year our hometown of Portland was recently named America’s Craft Beer Capital! While the city’s population is smaller than all of the other cities on the list with only about 66,000 people, there’s an average of 25.5 microbreweries per 100,000 inhabitants! Yep, Portlanders like their beer. Each year, droves of beer lovers trek to Maine just to check out the 60+ breweries across the state. 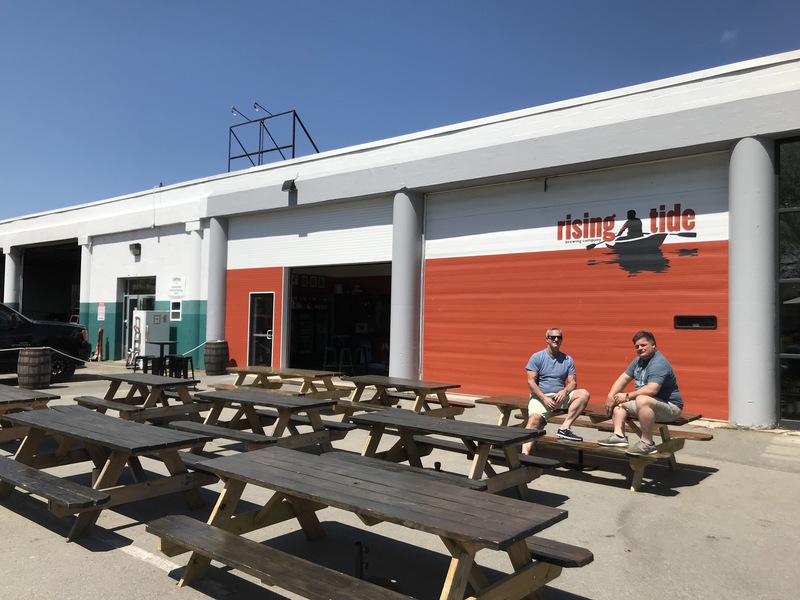 Here at OTTO we also have a bi-annual collaboration going with Rising Tide, our not too far away neighbors in the East Bayside neighborhood of Portland. Each year, we brew two beers with Rising Tide – Oscar Tango Tango Oscar, our spring collab (coming right up!) and Autohelm, which is released in the late fall. The two beers are available exclusively at OTTO locations and in the Rising Tide tasting room. 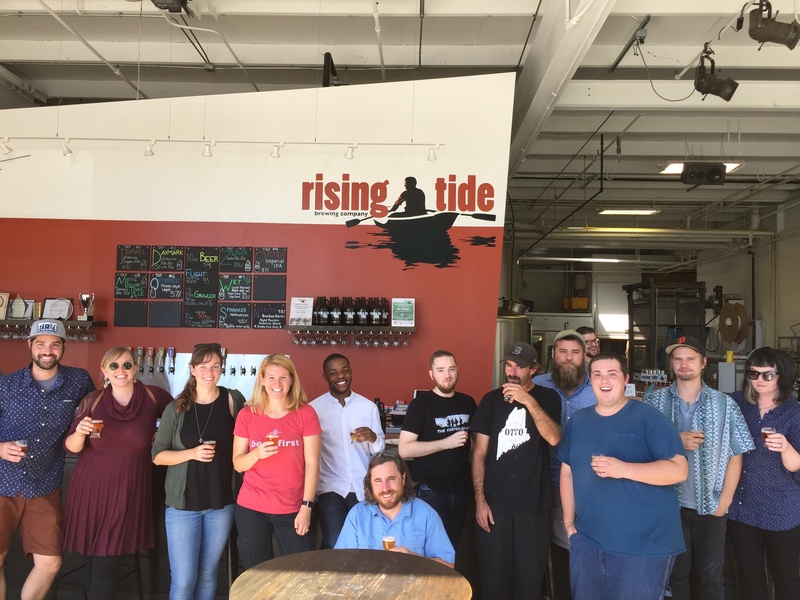 Our employees enjoy working together with the Rising Tide crew each year to brew these fan favorites. Back in the fall, we opened our newest location in Portland (250 Read Street) with our most taps yet – TWELVE. 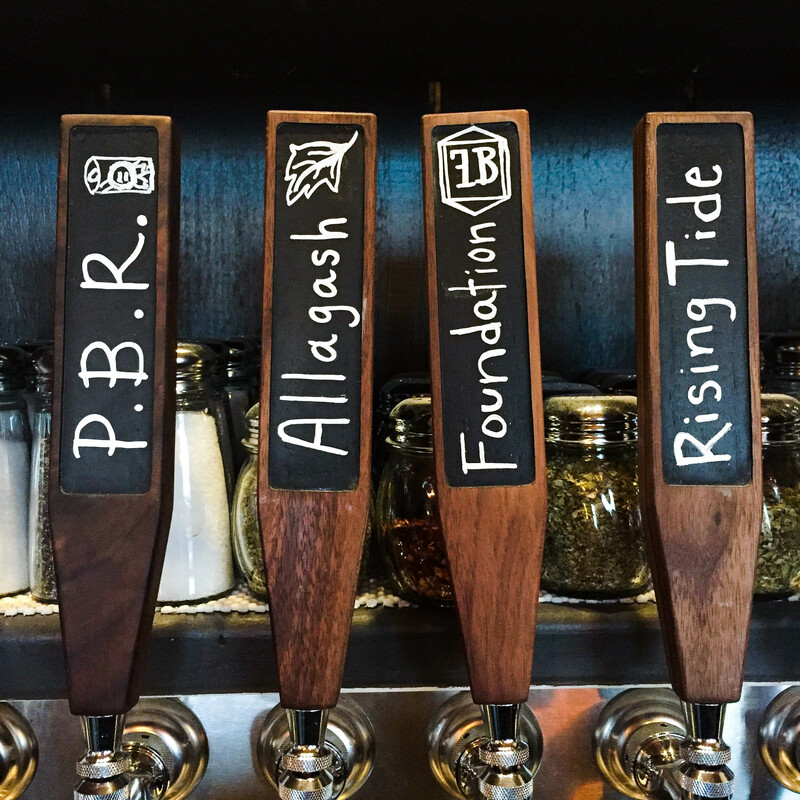 The majority of these taps serve up local Maine beers, but we always offer a few options for those wanting to grab some brews from a bit farther afield like Jack’s Abby and Lord Hobo. 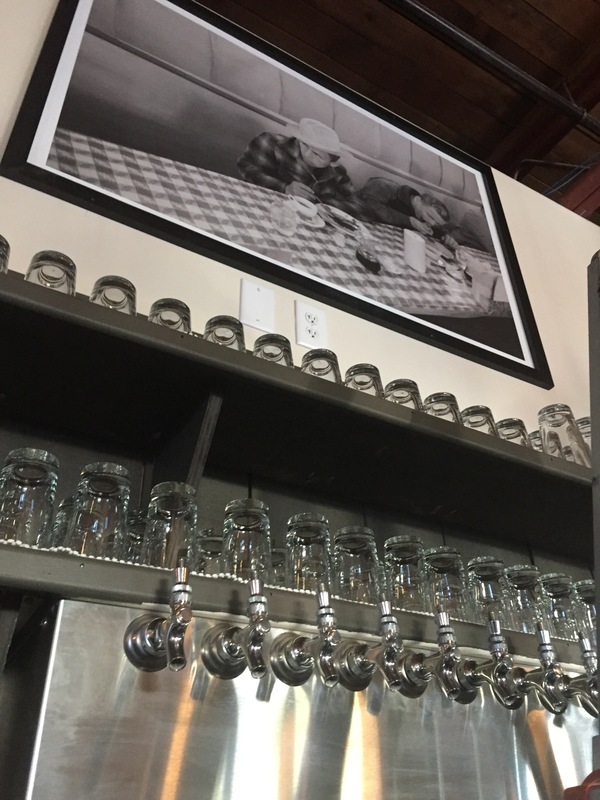 Since we opened our first location in 2009 in downtown Portland, we have enjoyed ‘growing up’ alongside the craft beer scene and supporting our local brewers. We’re proud to be currently serving beer from over 20 New England breweries and cider makers! 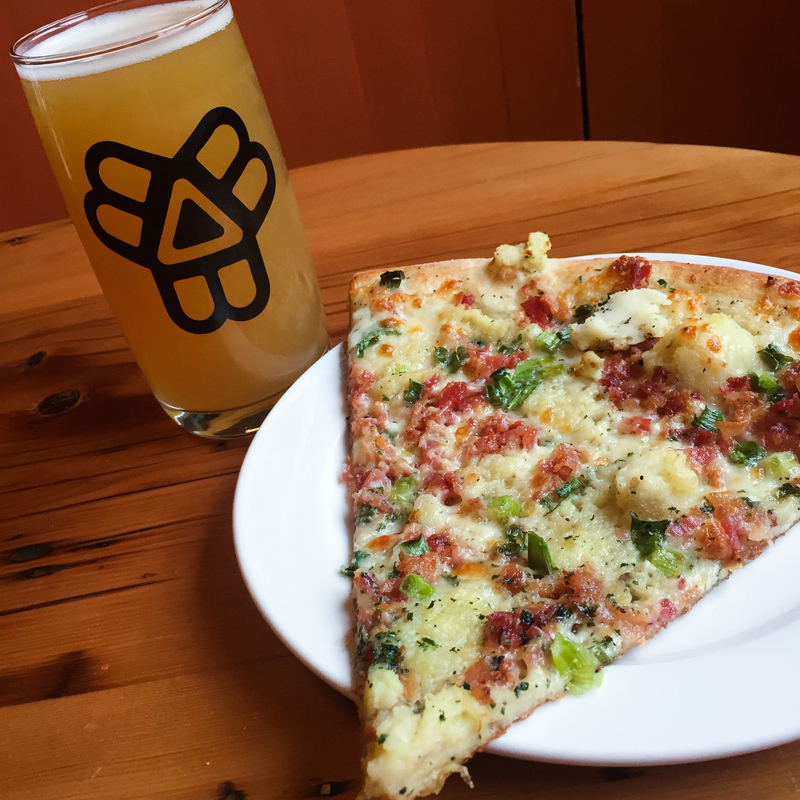 These local breweries make it easy for the love match between beer & pizza to continue…forever. Are you down and out with cabin fever this winter? 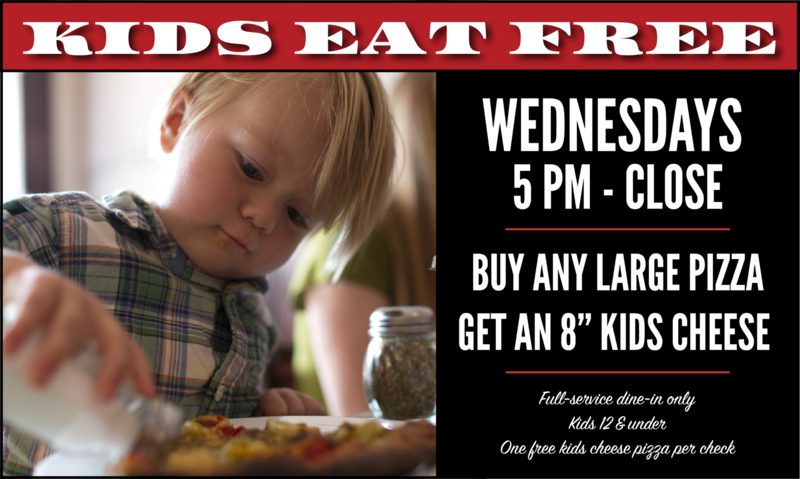 Get yourself out of the house and bring the kids along with you! 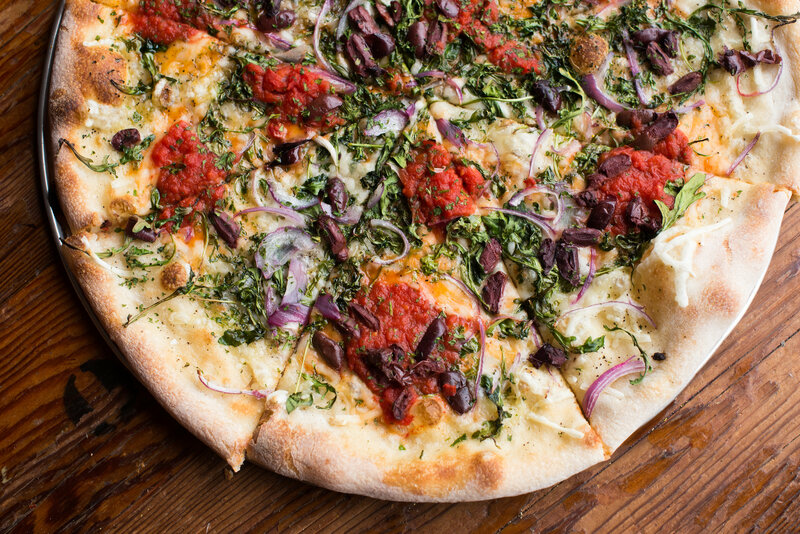 Treat yourself (and your wallet) and satisfy that mid-week pizza craving. 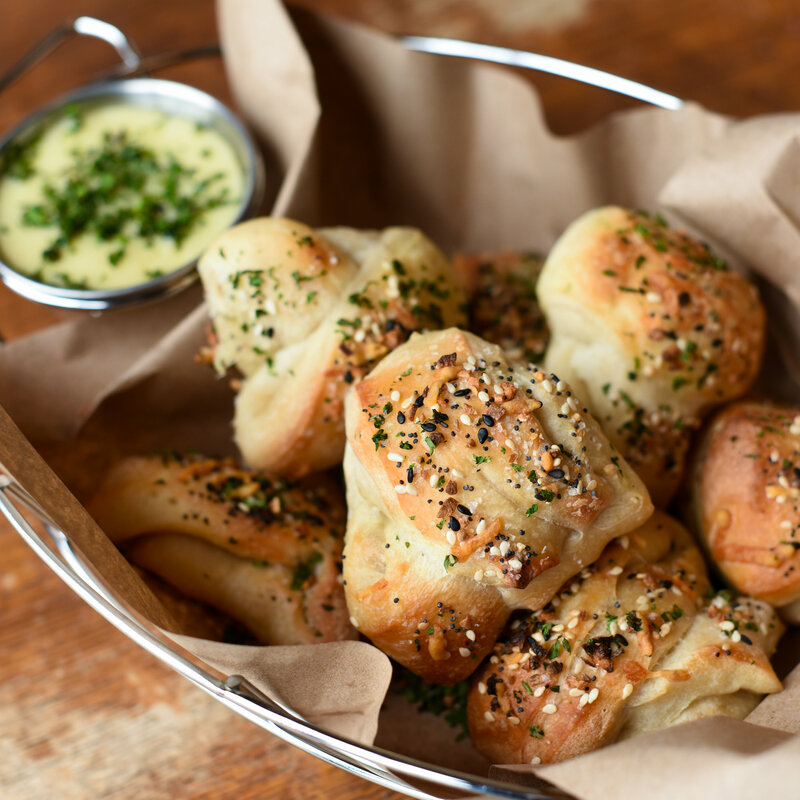 Because we know you really don’t want to cook tonight. Rising Tide-OTTO collab ‘Autohelm’ release party tonight at NEW Back Cove OTTO! Join us tonight at our brand spankin’ new Back Cove location at 250 Read Street in Portland, as we start pouring the third annual release of Autohelm, a deliciously hoppy amber ale brewed by Rising Tide Brewing Company in collaboration with OTTO. Our Autohelm release party is from 5-7pm today (Wednesday, Oct 12). Rising Tide and OTTO staff will be on hand to talk about the beer, and there will be schwag! Come check out our new digs while enjoying the first pours of this delicious winter beer. If you haven’t had an opportunity to try Autohelm in the past, you won’t want to miss it this year. 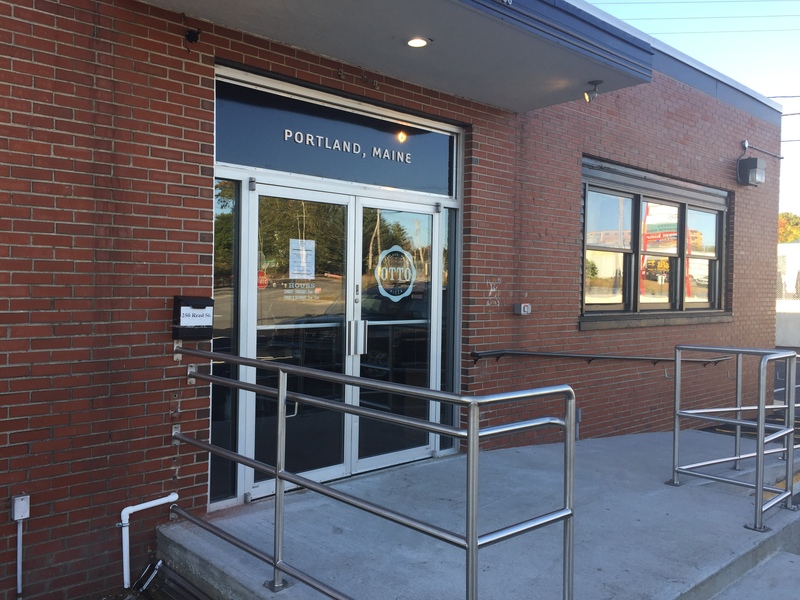 We are pleased to announce the opening of our new Back Cove location at 250 Read Street in Portland. 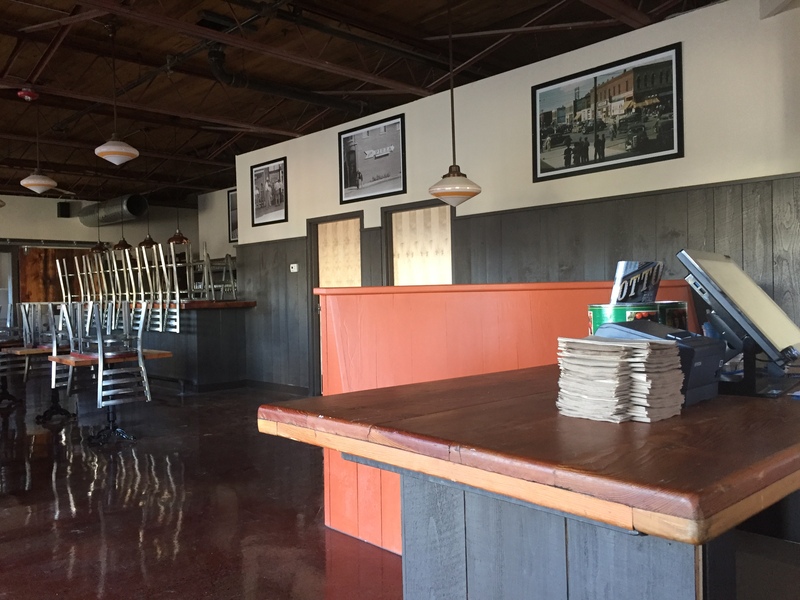 Currently offering takeout and delivery, this spacious location — the largest OTTO in Portland — will begin full-service dining and bar service on Tuesday, October 11. 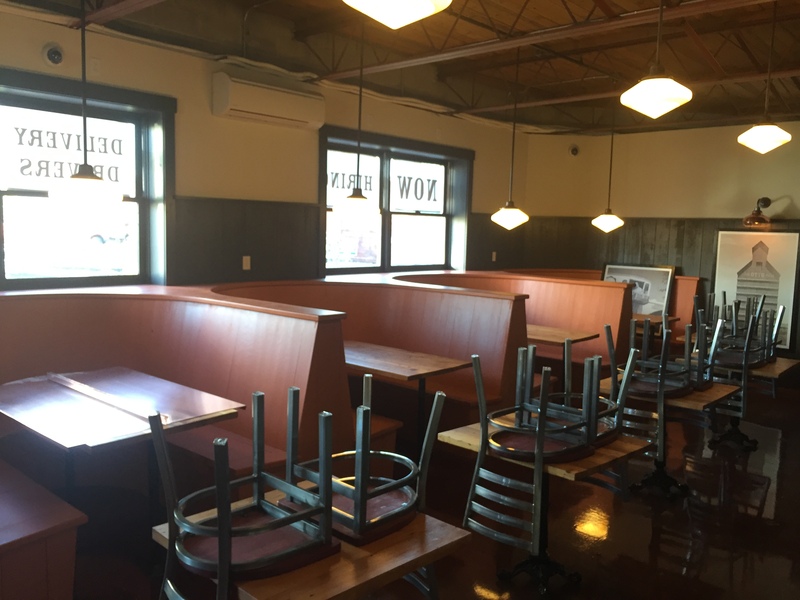 Its spacious dining room and U-shaped booths make it a perfect destination for larger parties, families, or for gathering with friends. Our bar features 12 taps — the most of any OTTO — and will feature the very best in regional craft beer. 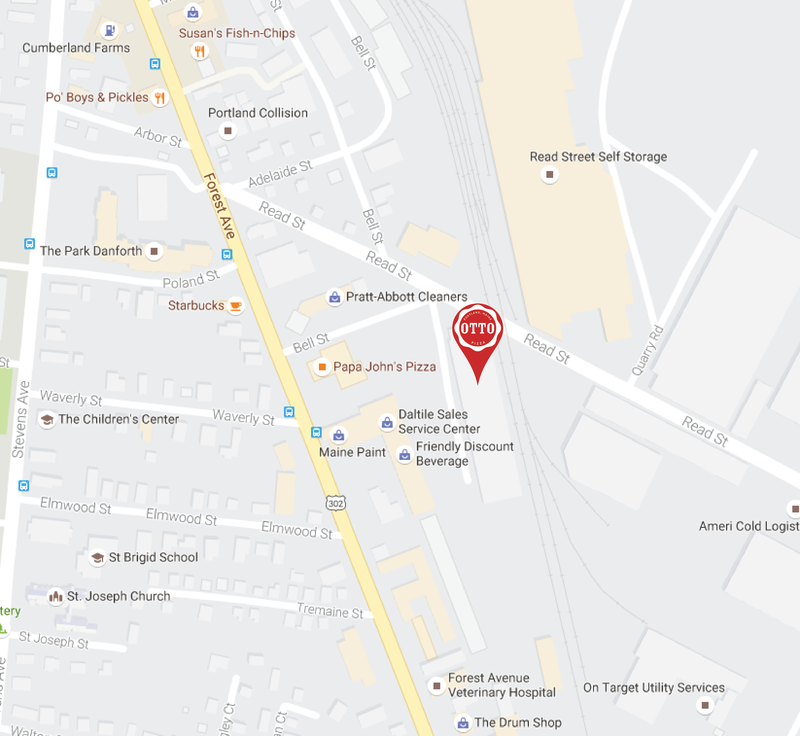 This central delivery location means faster deliveries in and around Portland. Faster drive-times mean more delicious (and hotter) pies straight to your home, business, or event. 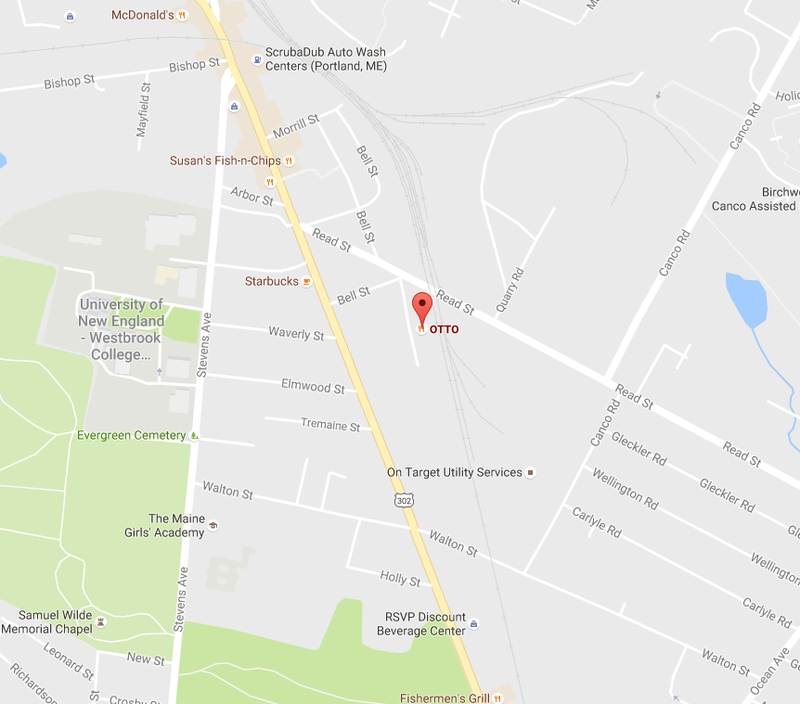 Located just off of Forest Avenue, behind Pratt-Abbott, OTTO’s Read Street location is just a hop, skip, and a jump from Deering Center, Woodford’s Corner, Baxter Woods, UNE, and Riverside.